Grand Cayman, the largest of the Cayman Islands, can easily be named the ideal Spring Break destination. This gorgeous island is recognized for its radiant beaches, vibrant corals reefs, and never-ending activities fit for the whole family. Offering natural beauty and rich culture, Grand Cayman has something for everyone. No matter what you seek in your Spring Break destination, you will find it in Grand Cayman. Whether you’re looking for an adventure-filled trip or a more relaxed and laid-back vibe, this island offers the perfect Spring Break vacation. For the adventure-seeking family, cross unforgettable island excursions off your bucket list. 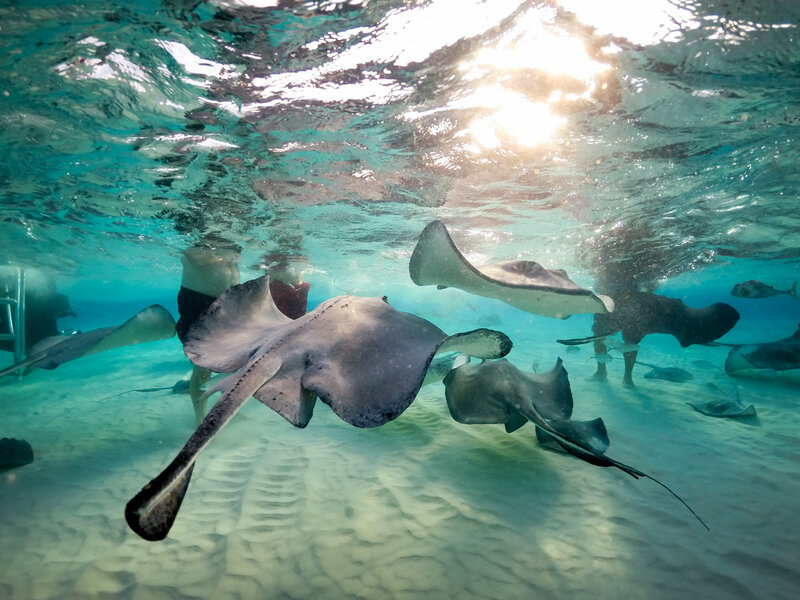 Explore the ocean, enjoy a boat tour featuring a meet-and-greet with friendly stingrays, or dive deep into the Caymanian waters to create unforgettable memories that your kids will be thanking you for in the years to come. Time off from school doesn’t mean education comes to a quick halt; it can mean, though, a lesson in nature Grand Cayman style. Guided tours are an ideal way to explore the island while learning about its history and spending time outdoors. Take a tour through locations of natural and historic significance, while admiring the many species of wildlife and plants that make Grand Cayman so unique. Turtle Centre is one of the island’s top attractions. There you can admire the glorious Caymanian wildlife, swim with turtles, and come nose to nose with sharks & other predators of the sea. If you’re looking to step outside the box, consider exploring the ocean from a totally new perspective in a 48-person submarine. Get a first-hand fish view of the Cayman Islands National Marine Park, featuring their vibrant underwater wildlife and famous coral reefs. The whole family is also sure to love the exciting kayak or catamaran ride through Bioluminescent Bay, floating through water that comes to life! All this excitement doesn’t mean Mom and Dad have no time for relaxation. Considering the beaches are the most alluring attraction, a day by the water is a must. With the powder white sand and crystal blue waters, it’s a beach lover’s dream. The island hosts a variety of beaches, each offering its own slice of paradise. Whether your plans include kayaking, laying out and tanning, or taking in the sunset, there’s a beach to create the perfect Spring Break vacation. What you seek is awaiting you in the Cayman Islands. For a top-notch experience, book your stay at Wyndham Reef Resort Grand Cayman for the ultimate Spring Break destination!